On June 12th, the Wonder Girls were spotted recording for an upcoming episode of MBC Beautiful Concert. In unofficial videos and photos the girls are seen dressed in their usual bold “Like This” stage outfits. 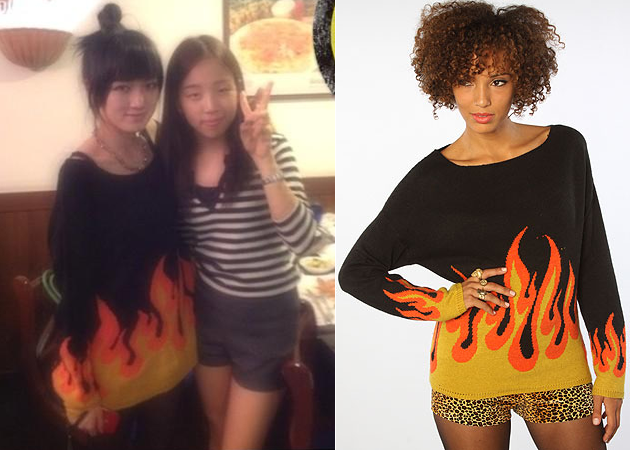 Member Ye Eun, wore my favorite look, pairing a colorblock skirt with the Favorite Things Tee from Joyrich. Karmaloop currently carries the male cut of the tee for $48.00. So both the ladies and fellas who dig her unisex tee, be sure to pick it up! As always repcode Kstyle can save you up to 20% off your Karmaloop purchase. Not to mention, Karmaloop is offering FREE shipping and a $20 giftcode for all orders over $75 with promo code Movin. Last month, Super Junior‘s Ryeowook, updated his Twitter with a picture of fellow members Kyuhyun and Eunhyuk enjoying dinner together. 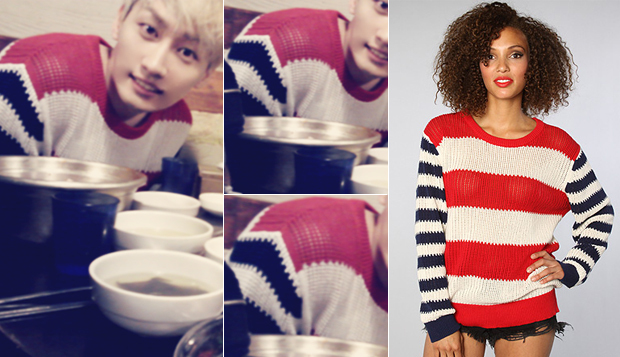 In the photo Eunhyuk is seen wearing the Joyrich Americana Knit Crew. Karmaloop currently has the crew available for $102.00! As always repcode Kstyle can save you up to 20% off your entire purchase. Happy Shopping! Luckily for fans who love Tripp NYC‘s Ombre Leopard Pant as well, can purchase it at Karmaloop on sale for $53.95! That’s 33% off regular price, for more savings be sure to use repcode Kstyle for up to 20% off your entire order! On April 22, 2012, Jewelry‘s Baby J updated her Me2day with a selca of her self in a familiar dress after filming Dream team in Yeosoo. The dress is none other than the Multi Geometric Dress from the Joyrich x GIZA collaboration collection! It is currently available at Karmaloop for $114.00, as always repcode Kstyle can save you up to 20% off your purchase.